Rent reduction. 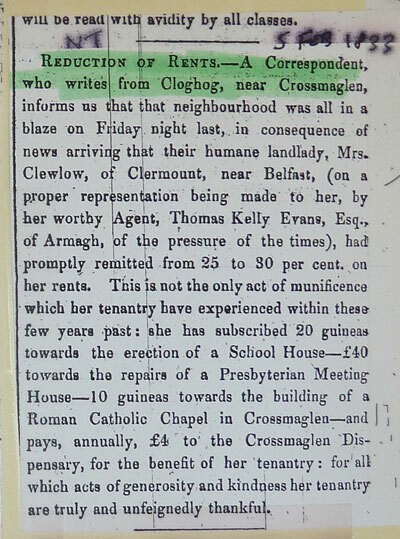 Mrs. CLEWLOW had family ties to the DONALDSONs of Freeduff, so it is not surprising that she was well acquainted with the issues of tenant rights, and also seems sympathetic to the needs of her tenants. These DONALDSONs were key figures in the 1798 uprising, and thereafter. NOTE: I should have footnoted that her agent and nephew, Thomas Kelly EVANS, was a son of Sarah Maria KELLY and Richard EVANS. They were closely related to the JACKSONs of Liscalgot & Urker Lodge. Letters from George JACKSON in the early 1800s, where he is advising his JACKSON nephew, mention them frequently. REDUCTION OF RENTS -- a correspondent, who writes from Clohog, near Crossmaglen, informs us that that neighbourhood was all in a blaze on Friday night last, in consequence of news arriving that their humane landlady, Mrs. Clewlow, of Claremont, near Belfast, on a proper representation being made to her, by or worthy agent, Thomas Kelly Evans, Esq., of Armagh, of the pressure of the times, have promptly remitted from 25 to 30%, on her rents. This is not the only active munificence which her tenantry have experienced within these few years past: she has subscribed 20 guineas towards direction of a school house -- £40 towards repairs of a Presbyterian meeting house -- 10 guineas towards the building of a Roman Catholic Chapel in Crossmaglen -- and pays, annually, £4 to the Crossmaglen dispensary, for the benefit of her tenantry: for all which acts of generosity and kindness her tenantry are truly and unfeignedly thankful. · p.304 Ann CLEWLOW, sister of Rev James CLEWLOW died in 1844 and the property that John DONALDSON (b.1772) resided on was sold in 1854. This ended this family's connection with this land. NOTE: This Saintfield Church connection intrigues me because of DONALDSON connections to Rev.Thomas Ledlie BIRCH of Saintfield at the time of the United Irishmen movement. James CLEWLOW, born was the son of James Hamilton CLEWLOW (Vicar of Saintfield 1756-1782) and Mary TRAIL (of Tullychin); d. 19 Nov 1809 aged 52; he was the vicar of Saintfield 1782-1809.